The top left knob controls the type of delay as shown to the right. You can see that it covers the most common delay types and probably a few delay models you don’t recognize. You have the typical delay models that are found on pretty much any digital delay pedal as well as a few interesting models that would only be used in certain situations. It’s worth mentioning that 16 delay types are advertised. But 4 preset positions shouldn’t count as a delay type. On the same knob you can see that there are four positions labelled 1-4. These are the TonePrint positions and allow you to load any preset you create from the TonePrint Editor (explained later). You can save any preset into one of three slots assigned to three footswitches. This means instead of needing to turn the top left knob to change between delay types or to access your TonePrints, you can save three of your favorite settings to the footswitches. The Flashback X4 also has a built in looper. A small toggle switch on the face of the pedal in between two knobs enable and disable the looper. When the looper is enabled, the four footswitches control different looper functions (as seen in the image later on). The maximum recording time for the looper is 40 seconds which is long enough for most situations. The looper also has a dedicated knob to control the loop’s volume level. It’s also nice to see that the looper isn’t just one setting on the delay type knob as it was in the original Flashback pedal. This means you can use the looper and continue to use the different delay types on your tone – something not possible with other pedals. To learn more about loopers and whether you might want to get a standalone looper instead of one built into the Flashback X4, check out my Ultimate Guide on Looper Pedals. The back of the pedal as shown below reveals stereo input/output, expression pedal input, USB & MIDI. For most guitarists the Expression pedal feature isn’t a big deal but for others it’s nice to see you have available. I was surprised to find that the Flashback X4 has MIDI – both MIDI In and Thru. It’s a feature only some guitarists will find useful so I won’t go into explaining how you can use MIDI to control the X4. I recommend reading the Flashback X4 Manual for more details on features such as MIDI or expression pedal input. Many pedals do not have a dedicated tap tempo footswitch – which is a major drawback for many guitarists. Being able to easily tap the tempo for your delay using your foot rather than having to turn a knob or push a button is a great feature. It does mean that the Flashback X4 is larger than it could have been, but the difference between the X4 and the smaller Flashback pedals are features like this one. If you’re unfamiliar with TC Electronic’s TonePrint, it’s an editor and app that allows you to customize your own presets and upload them to your pedal. 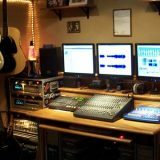 Famous guitarists have created their own presets and the X4 comes preloaded with presets from some popular guitarists. 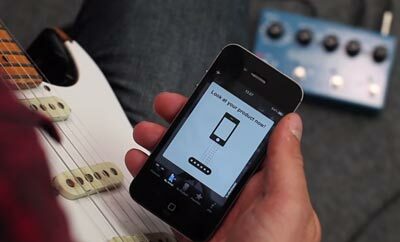 The smartphone app allows you to easily customize your presets then load them wirelessly to your pedal via your guitar’s pickups. So while you have the option to connect your pedal to your PC/Mac via USB, you can simply use your smartphone to ‘Beam’ your TonePrints to your pedal. Very nice feature considering the app is free. It’s also worth mentioning that a pedal like the Flashback X4 benefits from firmware updates. If you buy the X4, it’s worth keeping an eye on any firmware updates for improvements and bug fixes. As pedals add more features in, they become more complicated. The more footswitches, presets and effects available on a pedal, the more fiddly it can be. Fortunately the Flashback X4 is very straightforward. Simply turn the far left knob to select the type of delay (or to select one of your four TonePrints), then control the parameters using the three middle knobs – delay time, feedback and delay level. Simple, but it gets better. When you’re happy with a delay setting and want to keep it for future use, simply hold down one of the three main footswitches (not the tap tempo footswitch) and it will save it to that position. For a gigging guitarist this is a great ability as you can easily switch between different delay presets during a song. The Flashback X4’s looper works extremely well thanks to the four footswitches. As you can see below, each footswitch’s function is clearly labelled so you will know exactly which switch to use to undo a mistake or to start recording. Having four footswitches for a looper makes it far easier to use than other loopers with one or two switches. The Ditto Looper is a fantastic and simple looper, but having one footswitch does make it difficult for more complicated loop situations. While the Ditto has longer recording time than the Flashback X4, the X4 looper is far more flexible. The separate level knob for the looper makes it a breeze to mix your levels right. 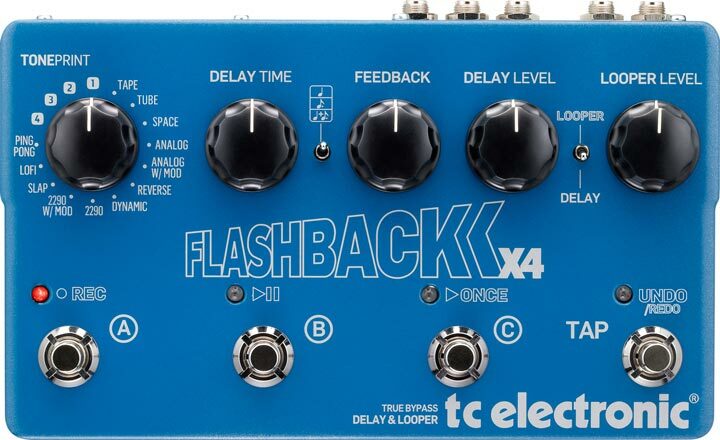 The Flashback X4 looper is one of the best loopers I’ve seen integrated into a delay pedal. My favorite feature which makes this such an easy pedal to use is the TonePrint app available on smartphones. Being able to customize a preset then beam it to your pedal without needing cables or Bluetooth is the way these apps should be used! As somebody who loves wireless, but hates Bluetooth, this is a fantastic feature. It works by transmitting the information via your pickups and it works perfectly. Most other pedals use either USB or Bluetooth to achieve this and once you try the beam function out, it becomes clear how perfect it is. Hopefully other pedal makers catch on to this rather than having to worry about the issues so many people experience with Bluetooth enabled pedals. One limitation with delay pedals like this is the inability to set an exact delay time in milliseconds. Say you have a song where you need a 458ms delay time, there’s no way for you to achieve that perfectly using the knob or tap tempo footswitch. 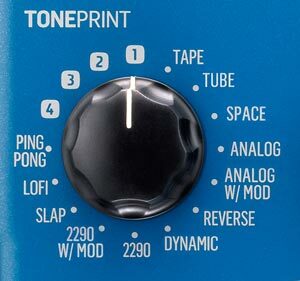 The TonePrint editor allows you to create a TonePrint and control every parameter exactly how you like it. You can set the delay time in ms and every other relevant parameter to an exact setting. Overall, the Flashback X4 is simple to use yet still has plenty of flexibility and features. Thankfully the days where digital delay pedals (and many analog pedals) sounded like rubbish are far behind us. While there are still some bad apples out there, most delay pedals sound great. I often give my musician friends and students blind tests to see if they can pick the difference between a $100 and a $300 delay pedal and nobody can consistently tell them apart (try it yourself on a friend and you’ll realize how bad everybody is at telling delay pedals apart). The Flashback X4 sounds fantastic. The analog style delays sound authentic and give a nice warm feel. My favorite type is the Space delay which creates a nice rich atmospheric floor to build on. The Reverse delay is surprisingly useful and creates a very nice smooth sound. Having such a wide range of delay types will ensure you never feel like the X4 is missing something. Never once did I think to myself “if only it had….” While some people will no doubt find features that could have been included, the X4 has pretty much everything you would need. The big chunky knobs feel secure and the large size means it isn’t going to roll around or flip over by accidentally tugging a cable. It’s nice and rugged and should last a long time. The Flashback X4 has been around for a while before I got my hands on one and it has already built up a reputation as being a fantastic delay pedal. If anything, this review confirms that it’s an excellent product and a great choice if you’re looking for a delay pedal with a wide range of features. When new students ask me for recommendations for a delay pedal, the X4 is normally the one they end up with and for good reason. Check out the price, full details, and reviews of the X4 here on Amazon. Serious guitarists: I only say ‘serious’ because most guitarists who play for fun don’t need this level of features. 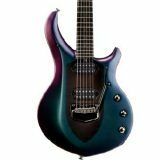 For most guitarists the original Flashback has almost all the same features at a lower cost and smaller size. But if you look at the original Flashback and think “it’s missing a lot”, then the X4 will be perfect for you. Gigging guitarists: not many delay pedals give you the ability to instantly access different presets like this one does. Having a decent looper built in also will remove the needed for a dedicated looper in some situations. Just keep in mind that to activate the looper you need to bend down and flick the toggle switch so it’s not perfect for live use – but it is handy if you want to use the looper feature on occasion. I see this as a great delay pedal for live use thanks to the wide range of delay types available and the control you have over it. Non-serious guitarists: if you don’t care about having 16 different delay options and just want something that you can control and adjust to your liking, then the X4 is overkill. The Flashback or even the Flashback Mini will have all the features most guitarists will need. If you just play for fun and don’t really care about precise settings or having multiple presets, the X4 might not be for you. After you have a play around with the different types, I recommend loading up the editor on your PC/Mac or load up the app on your smartphone. 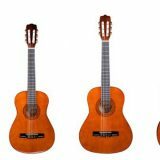 Browse through the TonePrints available for any guitarists you enjoy listening to and study them. Load one on your pedal and play around with it and try to work out why you like/dislike it. What makes the preset sound good or why does it suit or not suit you? Trying to analyze other presets will help you learn what settings suit you and what don’t. Use the editor to save any presets you like so you have something you can improve in the future. Your presets will get better over time as you learn how to tweak them so use the editor to keep track of any presets you create. If you like the sound of the X4 but aren’t sure if it’s for you or not, instead of looking at other brands, compare the different models in the Flashback range. The right pedal for you is the one that has the features you need so don’t stress about which one is the ‘best’. If you feel like the X4 is too over-the-top, check out the Flashback and the Mini. It will then be clear which one suits you the best. The other similar alternative to check out is the Line 6 DL4. It’s an older pedal but has a large following and reputation. The Flashback X4 vs Line 6 DL4 is quite an interesting comparison. Both pedals have very similar features and price so check it out for a close alternative. You could also compare it to the BOSS DD-20 but although I haven’t tried the DD-20 yet, I would say the X4 probably comes out on top simply thanks to the better layout. If you’re looking to buy a delay best but aren’t sure whether this is the best one for you, check out my Buyer’s Guide on finding the Best Delay Pedal. 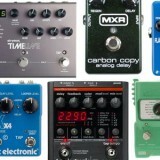 It explains how to find the best delay pedal for your needs. See information on pricing, availability and other reviews on the X4 here.